US motor vehicle tax stamp from 1946. Homepage. This page: An original vehicle taxation stamp of a type first introduced in the USA in 1942. 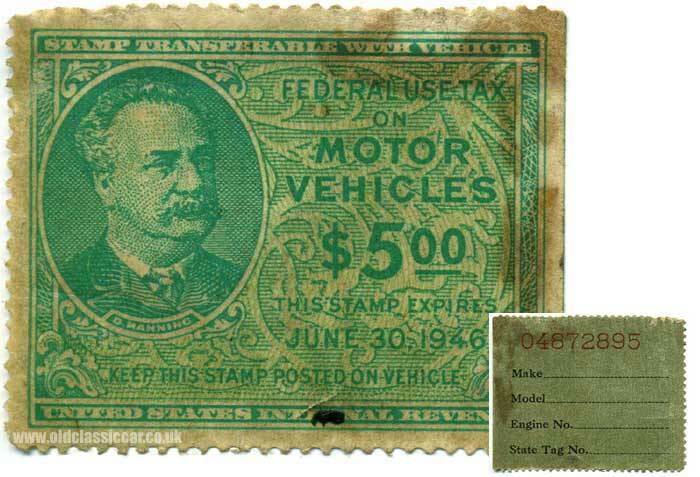 Motor Vehicle tax stamp $5.00. These stamps were introduced in February 1942 and lasted until 1946 in the USA. Similar to the British road tax disc, this stamp was designed to be stuck on the inside of a car's windscreen to prove that the "Federal Use Tax on Motor Vehicles" had been paid. They were issued by the United States Internal Revenue. This particular stamped expired on June 30th 1946. The Federal Use Tax was brought in by the US Government during WW2, partly to raise funds for the war effort, and also to encourage people to use public rather than private transport, thus minimising fuel usage. Various designs appeared during this time, the stamp shown here is green and white, and features the image of D. Manning. The cheapest stamp was 42 cents, rising to a maximum of $5 as with this example. On the rear, is a code number and space to complete the car's make, model, engine number and State Tag number. This stamp looks to have been lightly affixed to a car's screen, yet was never filled in by the owner for some reason. This particular stamp issue was known as Scott number RV42. Who was D. Manning?